The board settings can easily be accessed by clicking on the board title drop down menu. As described below, board settings are divided into 3 panels: Overview, Integrations, and Members. In this panel, you can edit the board title, bord purpose, background image, visibility and location. You can also change the card style and enable rows. You can make a board private or team visible. 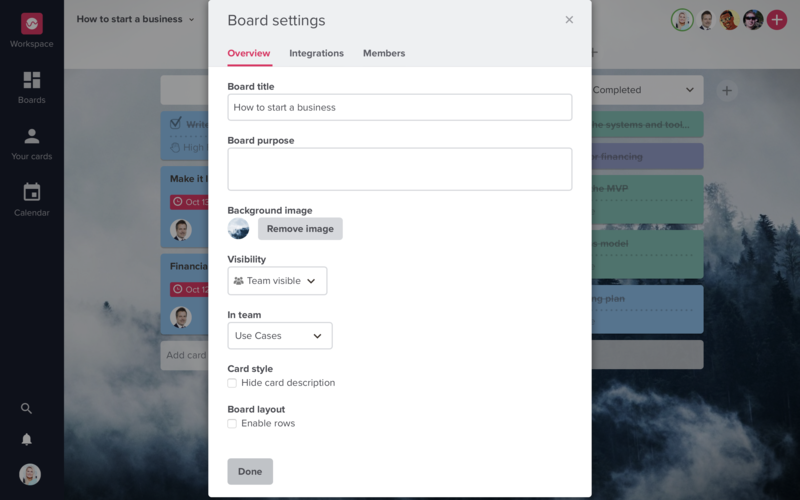 A private Board is only visible to the users who are directly invited, while a team visible board is available for everyone in the team where the board is located. For more information on private boards, follow this link. The "Team" field enables you to categorize Boards in various teams. There are currently two integrations available on a Board; Calendar and Slack. Enabling this integration will allow the members on this board to view it in their calendar. You can read more on how to set this up in our guide. Setting up a Slack integration will send notifications from this Board to a Slack channel of your choice. The notifications sent includes message like Card completed, Comment added etc. You can read more on how to set this up in our guide. The member panel shows which team members are currently collaborating on this Board. You can quickly remove/add board members, and doing so will not delete any data. For example if a person has created a Card and is removed from the Board, the Card will still remain.